RF/Microwave filters are a fundamental component of signal processing. They pass signals within their passband and reject signals outside the passband. Marki filters are reflective, meaning that they reflect signals outside of the passband. Important specifications include rejection (the measure of how well undesired signals are rejected), steepness of the rejection skirts, insertion loss, and return loss. Typically size is also important for filters; there is a fundamental tradeoff between rejection and filter size, as both are determined by the ‘order’ of the filter. A higher order filter has more rejection, but also requires more space and has a higher insertion loss. Marki filters offer moderate rejection and rejection skirts, but across very broad bandwidths. A lowpass filter has a direct connection from input to output, passing DC and all frequencies below some specified 3 dB cutoff frequency. After the 3 dB cutoff frequency the insertion loss increases dramatically and the filter (ideally) rejects all frequencies above this point. 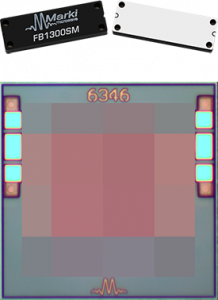 Physically realizable filters have ‘re-entry’ modes that limit the high frequency capability of the filter. At some higher frequency the rejection of the filter degrades, and higher frequency signals can appear at the output of the filter. Marki lowpass filters are microstrip filters that are CAD optimized and built on a low loss substrate, offering very broad rejection bands before re-entrant modes appear. A highpass filter will reject signals below their designed frequency of operation, and pass all signals above this. Important specifications include rejection of low frequency signals, insertion loss, return loss, and insertion loss flatness above the 3 dB cutoff frequency. Marki highpass filters are based on a cavity design that offers operation to very high frequencies with broad, resonance free passband and stopbands. A bandpass filter is capacitively coupled between the two ports, offering rejection of both low frequency and high frequency signals and selecting a particular band referred to as the ‘passband’. Important specifications include the center frequency, passband (expressed either as start and stop frequencies or as a percentage of the center frequency), rejection and steepness of rejection, and width of the rejection bands. All bandpass filters will have re-entrant modes at higher frequencies, so the width of the high frequency rejection band is an important consideration. Marki bandpass filters are microstrip filters that are CAD optimized and built on a low loss substrate, offering extremely broad rejection bands. Marki offers two types of bandpass filters: CAD-optimized microstrip filters built on a low-loss substrate offered in surface mount and connectorized packages, and GaAs MMIC filters with tight fabrication tolerances offered as bare die. Both offer low loss and extremely broad rejection bands. A diplexer is a three port device that combines or divides a common signal according to frequency, into low pass and high pass ports. Unlike a duplexer, which combines two bandpass filters, diplexers are very broadband. Important specifications include frequency coverage, out of band rejection for the high/low pass filters, isolation between the high/low pass filters, insertion loss, and return loss. 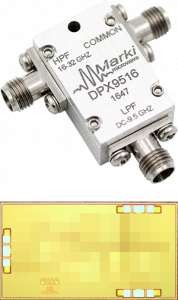 Marki diplexers offer extremely broad, resonance free passbands. Diplexers can be used as low loss combiners or dividers for signals with different frequencies or as reflectionless filters (with one port terminated) at the output of mixers and other nonlinear devices with many harmonics. Marki offers two types of diplexers: CAD-optimized microstrip filters built on a low-loss substrate offered in surface mount and connectorized packages, and GaAs MMIC filters with tight fabrication tolerances offered as bare die. Both offer low loss and extremely broad rejection bands.